Something’s stirring up in the night sky. This Friday, July 27, Earthlings will be able to view a lunar eclipse that lasts for one hour, 42 minutes, and 57 seconds – the longest lunar eclipse of the century so far. Many people call this event a “blood moon”. During a lunar eclipse, the Moon will pass between the Earth and the Sun, moving through the center of the Earth's shadow. Instead of causing the Moon to turn dark, this actually makes it glow with a soft red-brown color. The reddish color occurs because sunlight travels through the dust and gases in Earth’s atmosphere, scattering more of the short blue wavelengths of light, and projecting the longer reddish wavelengths onto the Moon's surface. On top of this, the red Moon will have some company on Friday. On July 30 and 31, Mars will be at its closest approach since August 2003 at a mere 57.5 million kilometers (35.78 million miles) away. This means that Mars should also be exceptionally clear in the sky on July 27, the night of the lunar eclipse. Many people on Earth will be able to witness the event, except, unfortunately, most of North America. The best views will be obtained from sky gazers in Africa, the Middle East, southern Asia, and the Indian Ocean. Parts of Europe might be lucky enough to get a glimpse, weather dependent, at moonrise and Australasia will hopefully see some effect at moonset. This is, of course, if you survive the doomsday. For most us, this celestial show will be a spectacular reminder of our place in the Solar System or at least just a pretty thing to look at in the night sky. However, not all of the Internet is completely happy with this rosy interpretation. As per usual, the Mars and blood moon combo is stoking fears among conspiracy theorists and the superstitious. Their initial theory rested on a series of lunar eclipses that took place between 2014 and 2015 and coincided with Jewish holidays. It’s a fair assumption to say that this was wrong. 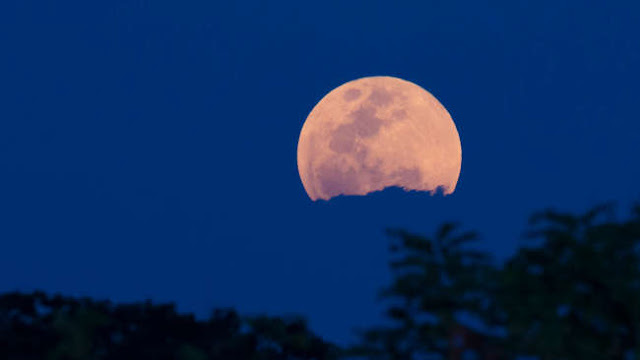 Nevertheless, the blood moon still doesn’t rest easy with some people, such as prophecy news online bloggers who believe that the July 2018 event coinciding Mars' close approach and other astronomical phenomena could hint at the fulfillment of Joel's prophecy in the very near future.